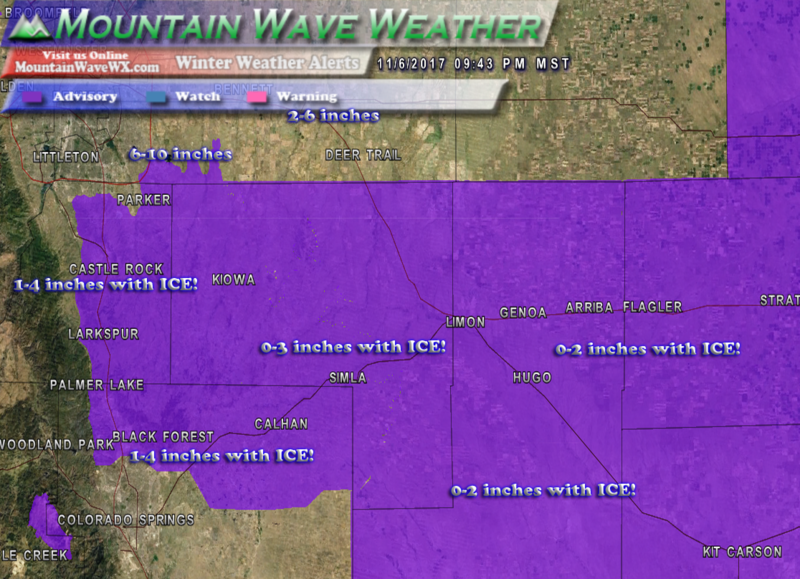 The Winter Weather Advisory along the Palmer Divide is mainly for ice accumulation due to freezing rain and fog. Snow amounts will be minor for most areas. Hazards: A mix of freezing drizzle and snow expected. The ice will result in difficult travel conditions. Total ice accumulations of around one tenth of an inch are expected. Some snowfall is also expected for these areas. Models seem to be in pretty good agreement that this will not be a major snowfall event for us living along the Palmer Divide. Just like the past few storms, expect rain to chance over to freezing rain with freezing fog late tonight into tomorrow morning. 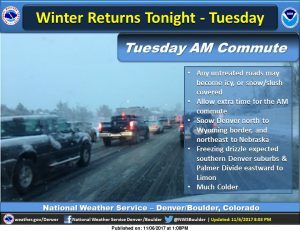 Snow will come through the day Tuesday on and off, with most locations South of Denver ending up in the 0-3 inch or 1-4 inch range. Why such a big range? Click on the image to see the Nam3K model forecast for radar through Tuesday evening. 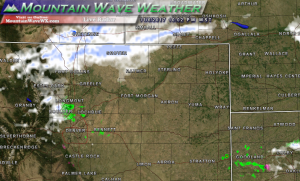 Notice in the radar loop above (click on it to watch it animated) that most of the activity stays around Denver and points North during the overnight and morning hours tomorrow. By later in the day, banded snowfall begins to move further South. This is when we could see more of our snow accumulation as opposed to the morning hours. Banded snowfall is difficult for models to predict, we can tell that bands will set up but we usually don’t know where or how intense they will be. Any areas caught under one of those snow bands could end up in the higher forecast range for snow, while areas just a few miles North or South could see little to no snow accumulation. For a tricky storm like this, it’s best to focus on the impacts rather than how much snow certain areas will get. 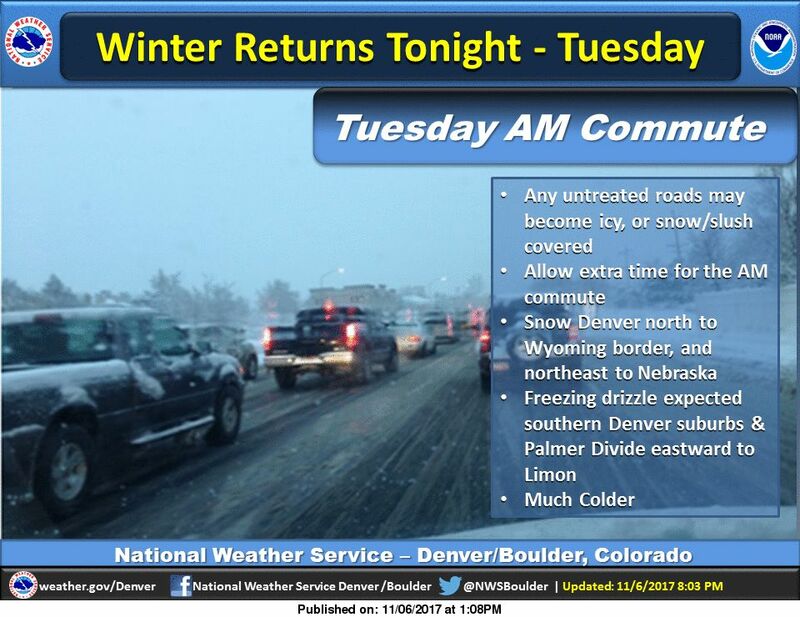 NWS specifically mentions the Palmer Divide area for freezing and icy conditions on Tuesday. Stay weather aware! As of the writing of this post, most of the snow was hanging around the Wyoming/Colorado border. Expect this to begin to move South in the overnight hours. Stay warm, stay safe and we’ll pass along any updates to this forecast if needed on Tuesday morning. For now, things look pretty on track!